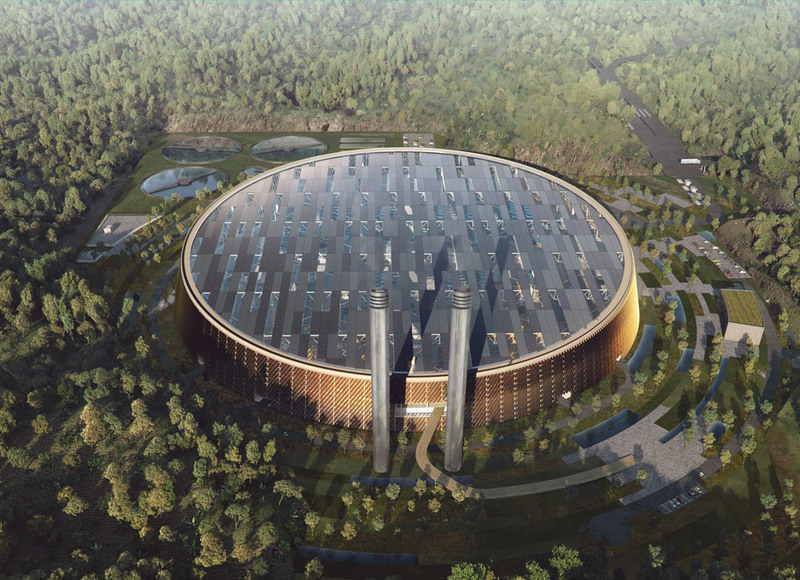 Danish firms Schmidt Hammer Lassen Architects and Gottlieb Paludan Architects have won a competition to design the world's largest waste-to-energy power plant in China (+ movie). 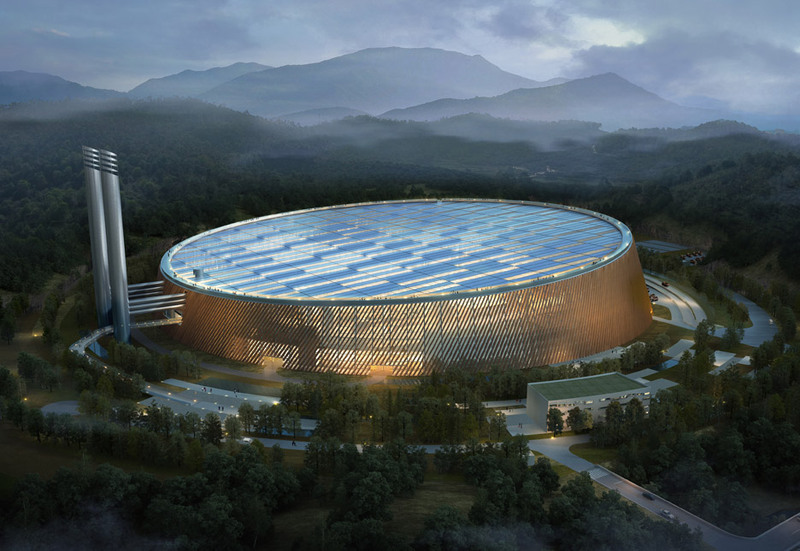 Proposed for the mountainous region on the outskirts of Shenzhen, the waste-to-energy plant is expected to incinerate 5,000 tonnes of rubbish per day – approximately one third of the waste generated by the city's 20 million inhabitants each year. According to the architects, the facility will "utilise the most advanced technology in waste incineration and power generation". The huge circular building will boast a 66,000-square-metre roof, two thirds of which will be covered with photovoltaic panels, allowing the building to generate its own sustainable supply of energy. It will also feature a series of visitor facilities, including a looping walkway that offers a behind-the-scenes look at the inner workings of the plant, before leading up to a rooftop viewing platform. 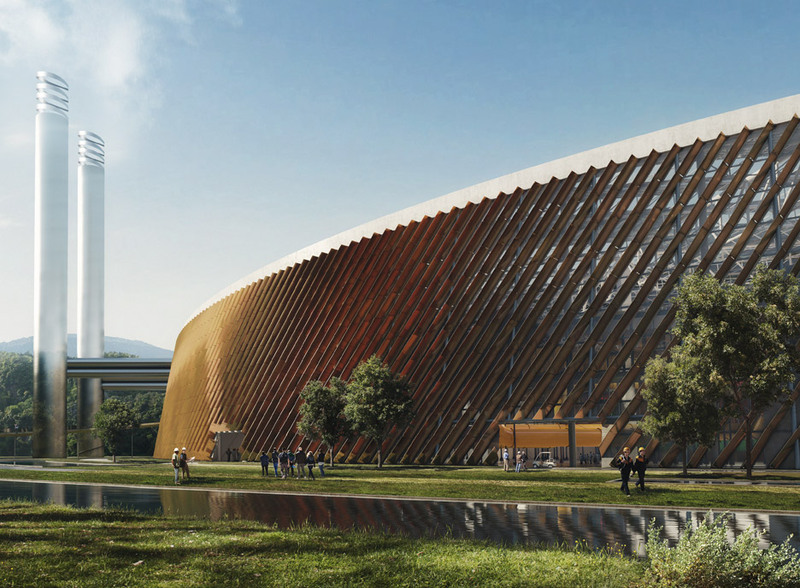 "The project firstly aims to provide a clean, simple and modern technical facility to deal with the city's growing waste," explained architect Chris Hardie, head of Schmidt Hammer Lassen's Shanghai office. "At the same time it aims to educate visitors to this growing waste challenge by taking them on an elevated walkway tour of the plant that ends with a 1.5-kilometre panoramic view of both the surrounding mountains and the 66,000-square-metre roofscape that will be geared to producing actual renewable energy," he told Dezeen. The circular structure will encompass the entire plant, including auxiliary buildings – the aim was to keep the facility as compact as possible. The entrance will be a snaking ramp that starts from a landscaped park and winds up between a pair of smokestacks. 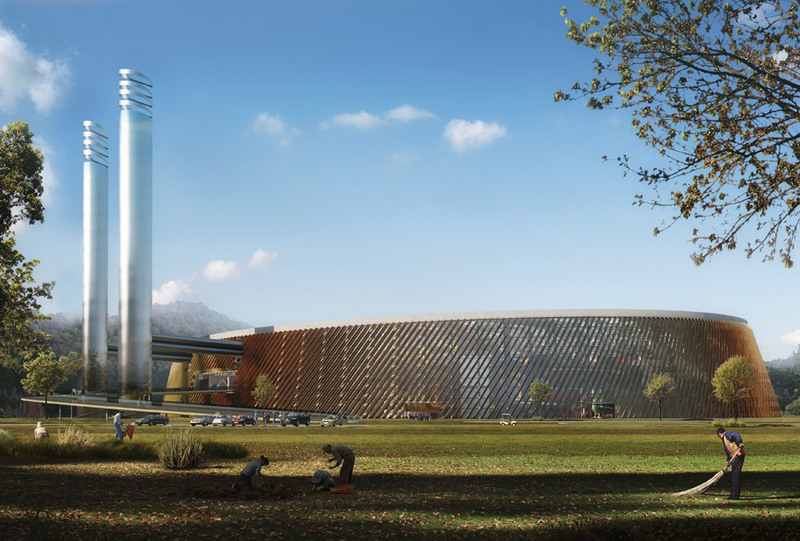 The Shenzhen East Waste-to-Energy Plant is scheduled to be operational by 2020. Schmidt Hammer Lassen and Gottlieb Paludan were selected ahead of five other teams including Arup and AECOM. Schmidt Hammer Lassen is currently working on a number of projects in China, including a major new cultural quarter for Shanghai and the redevelopment of the 2010 Shanghai Expo site. Gottlieb Paludan is a specialist in industrial architecture. Projects include a series of brick-built substations, cooling plants and waterworks across Denmark and a biomass-fired heating and energy plant in Copenhagen. Other Danish firms involved in this sector of architecture include Bjarke Ingels' studio BIG, which is building a combined power plant and ski slope in Copenhagen, which will blow smoke rings. Visualisations are by Beauty & the Bit and Ginsun. Models are by JR Models.